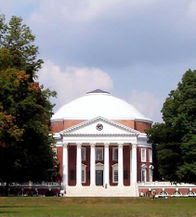 The University of Virginia (also called U.Va., UVA, Mr. Jefferson's University, or The University) is a public research university located in Charlottesville, Virginia, founded by Thomas Jefferson. Conceived by 1800 and established in 1819, it is the only university in the United States to be designated a World Heritage Site by UNESCO, an honor it shares with nearby Monticello. 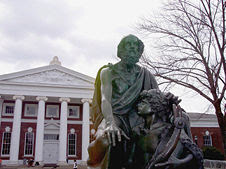 The University is notable in U.S. history for being the first educational institution to offer academic programs in disciplines now common, such as astronomy and philosophy. Its School of Engineering and Applied Science was the first engineering school in the United States to be associated with a university. 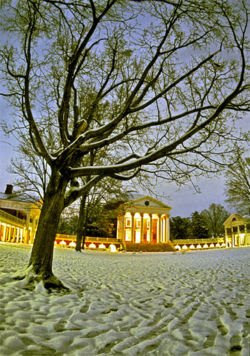 Officially, the University of Virginia is incorporated as The Rector and Visitors of the University of Virginia. 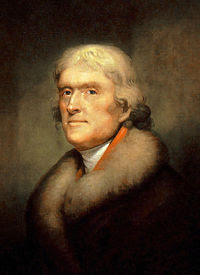 Thomas Jefferson set to work on building plans that would mirror his philosophical vision. For Jefferson, the college experience should take place within an "academical village," a place where shared learning infused daily life. Plans were developed for ten Pavilions—stately faculty homes with living quarters upstairs and classrooms downstairs—attached to two rows of student rooms and connected by an inward-facing colonnade. Each Pavilion was identified with a subject to be studied and inhabited by the professor who taught that subject. At the head of the shared lawn would stand the library (not, as in most other colleges and universities of the time, a chapel), its dome shape inspired by Rome's Pantheon and symbolic of the enlightened human mind. The plans grew to include two more colonnades of student rooms facing outwards and attached to a set of "hotels" where private businessmen served food for the students. 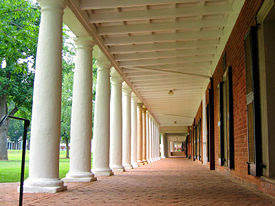 The University of Virginia is made up of ten schools in Charlottesville, plus the College at Wise in southwest Virginia. U.Va. offers 51 bachelor's degrees in 47 fields, 83 master's degrees in 66 fields, six educational specialist degrees, two first-professional degrees (law and medicine), and 59 doctoral degrees in 58 fields. The University is also endowed with several affiliated centers including The Weldon Cooper Center for Public Service, The Sorensen Institute for Political Leadership, and The Miller Center of Public Affairs. The University of Virginia Art Museum is dedicated to creating an environment where both the University community and the general public can study and learn from the direct experience of works of art. The University of Virginia remains the No. 2 best public university in the 2008 edition of the U.S. News and World Report rankings. In the 11 years since U.S. News began ranking public universities as a separate category, U.Va. has ranked either No. 1 or No. 2. U.Va. continues to rank in the Top 25 among the best of all national universities, public and private.